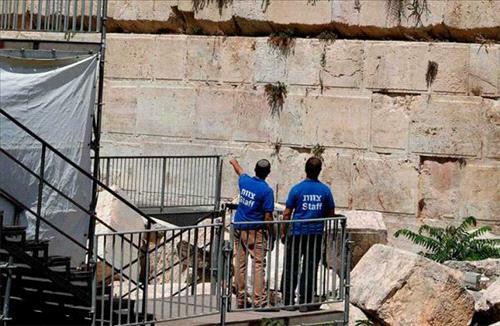 AMMONNEWS - Minister of State for Media Affairs and Government Spokesperson, Jumana Ghneimat, on Wednesday condemned the continued illegal Israeli excavations at the Al-Buraq Wall area west of the Al-Aqsa Mosque. Ghneimat expressed Jordan's absolute rejection of the Israeli authorities' moving of the stone, which fell on Monday from the Al-Aqsa Mosque's western wall. This move, Ghneimat said, constitutes an interference in the jurisdiction of the Jerusalem Awqaf Department, which is the national body that has the authority over all the affairs of the Al Aqsa Mosque / the Al Haram al-Sharif under international law. Ghneimat stressed that these serious and irresponsible Israeli actions constitute a flagrant violation of international laws and conventions. She underlined the need for the international community to act and shoulder its responsibilities in pressuring Israel to stop its violations against the holy sites in Jerusalem. She noted that the Israeli government alone bears full responsibility for the safety of the Al-Aqsa Mosque with all its facilities, and that it must immediately stop its unilateral actions.